Lovage is complete and I absolutely adore it. I’m so pleased with the fit and the clarity of the colorwork. 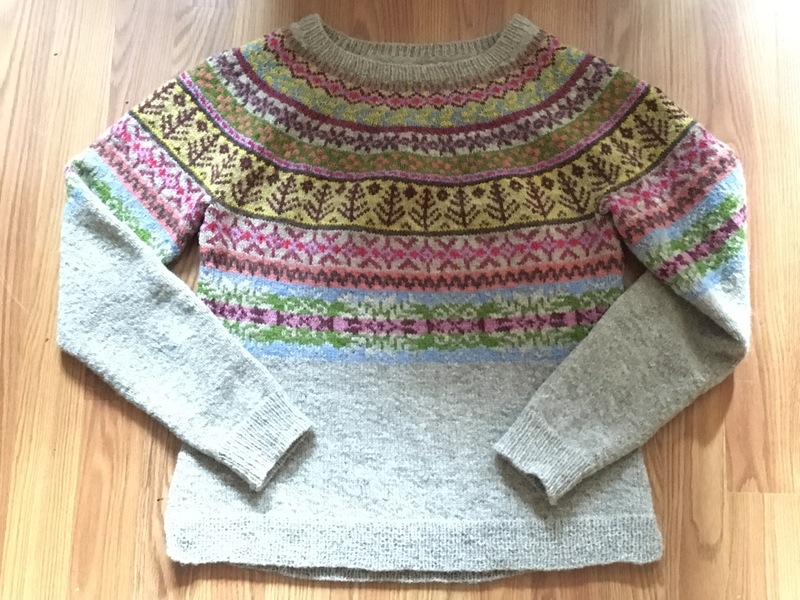 Hopefully Rhinebeck Weekend will be suitably chilly so I can wear this sweater all day long! 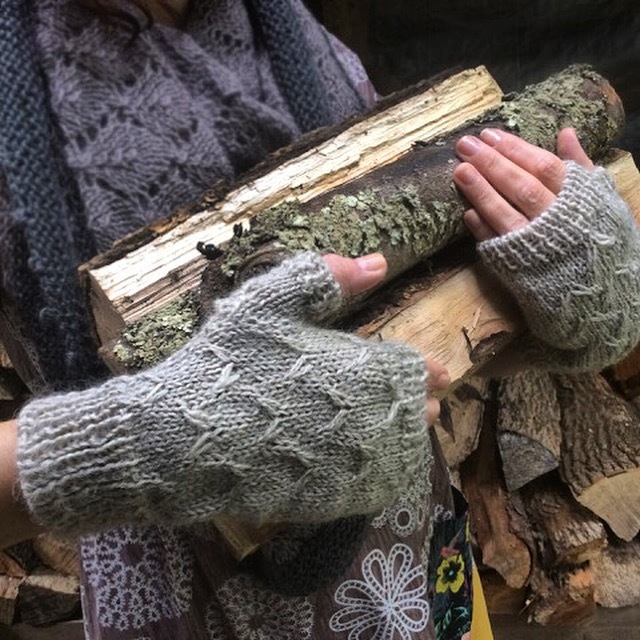 I hope this design for a quick and versatile pair of mitts inspires you to make an impulse purchase of farm yarn at a fiber festival. 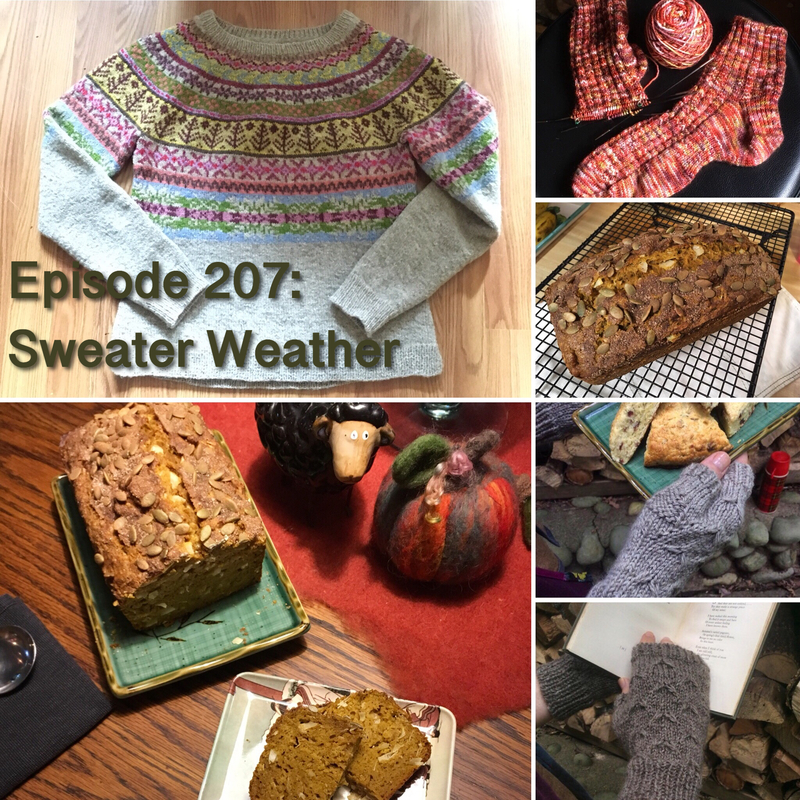 I use the funds from pattern sales to cover the costs of this podcast, so your purchase helps to keep Yarns at Yin Hoo on the air. This pattern has been tech edited and test knit; I’m so grateful for the work of Ellen, Marybeth, Holly, Rachel, and Amy. They are pictured here in Carole Foster’s Romney-Wensleydale X yarn, held double. 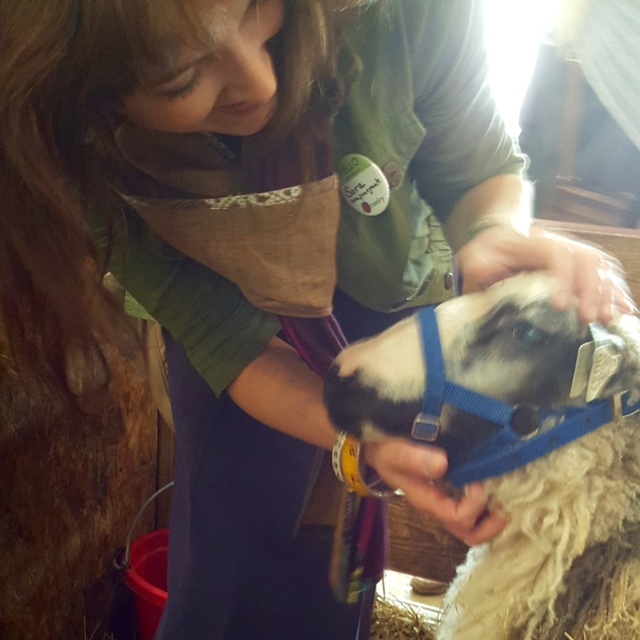 You can find this yarn as well as Carole’s new Blyth yarn, in the Foster Sheep Farm booth, Building 31, at the New York Sheep & Wool Festival this weekend. The sample mitts will be on display, and you can purchase the printed pattern. 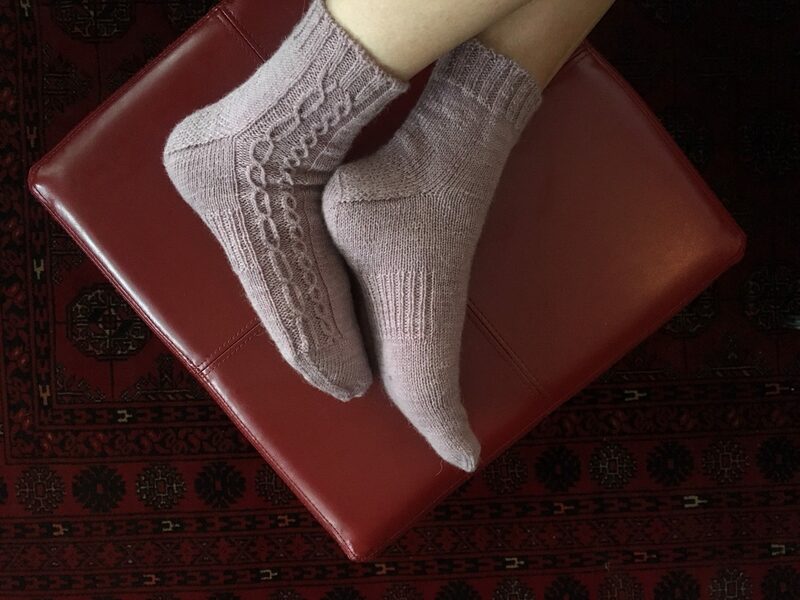 Lovage, designed by Marie Wallin — knit with Jamieson & Smith Shetland Supreme and Shetland Jumper Weight yarns. I made a variety of modifications to get the fit I wanted. 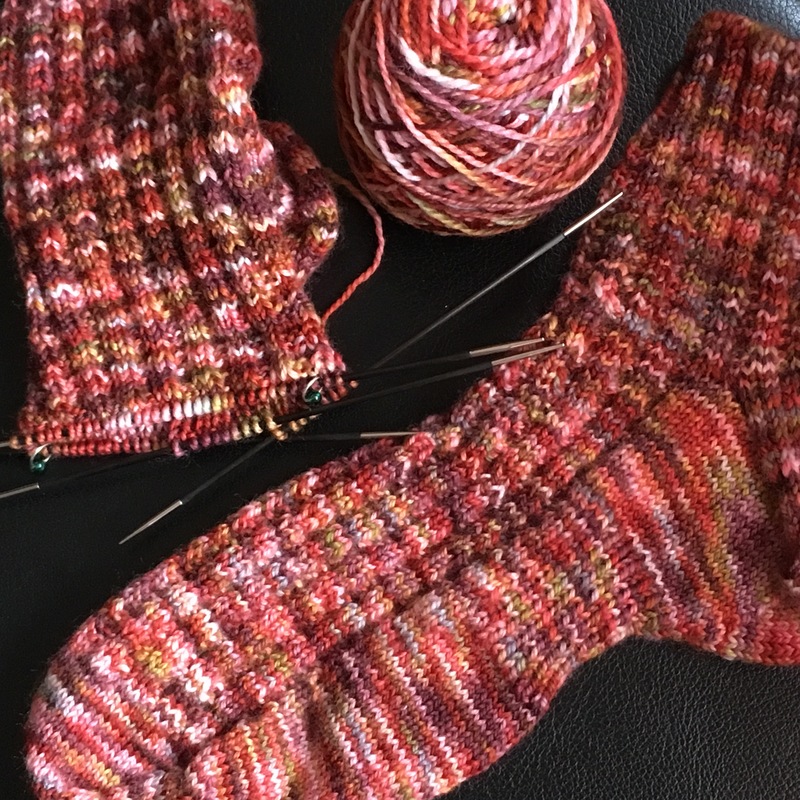 Knitting an improvised texture pattern using Carole Foster’s Northumberland Sock yarn. I just love the way this yarn knits up. It’s plump and substantial, and Carole’s colors are a dream. Preheat oven 350. Butter a 9″ pie dish. Blend on high speed for one minute to mix ingredients. Pour into prepared pie dish. Sprinkle an additional 1/2 c. coconut into dish and add a liberal amount of freshly-grated nutmeg. Bake for 55 minutes or until a knife inserted in the center comes out clean. This pie is best if cooled completely before serving. The Pumpkin Bread I Can’t Stop Eating — that’s how to find the recipe on Food52’s website. The genius ingredient is a grated apple in the batter! 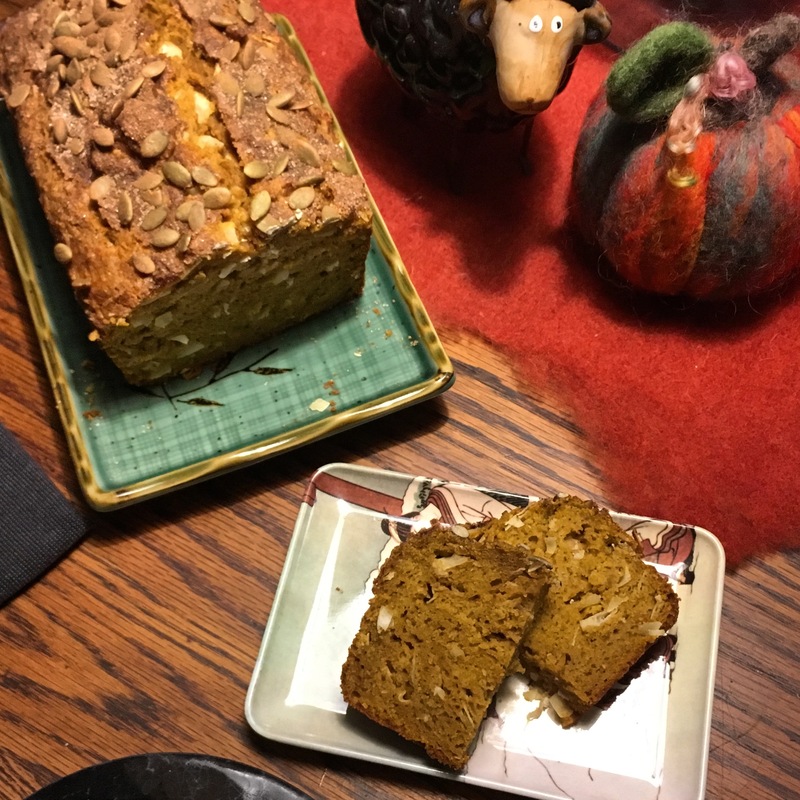 I cut the sugar to 1/2 cup, and added another few tablespoons cinnamon-sugar to the top of the loaf, along with a liberal sprinkling of pumpkin seeds. 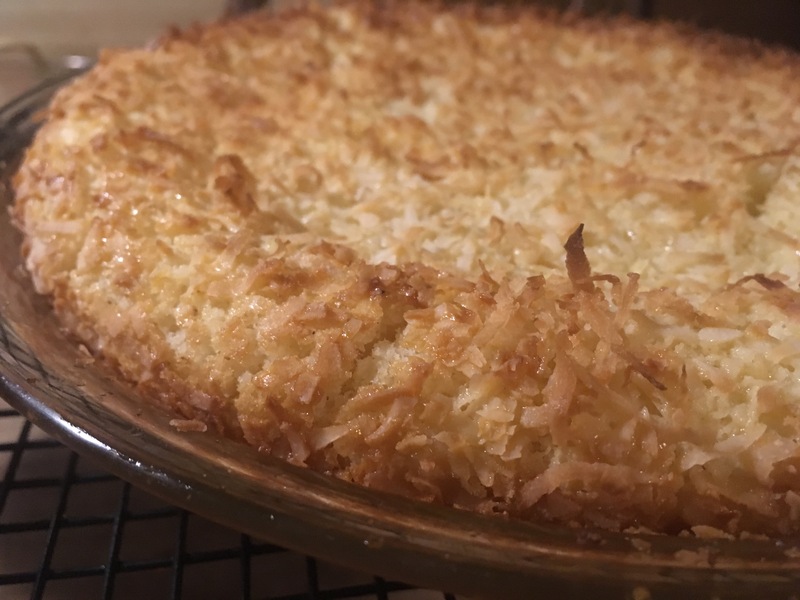 The recipe calls for walnuts, but I didn’t have any on hand, so I substituted coconut chips. This is a moist and delicious bread that’s sure to please on a crisp fall day.